Robert, Craigs nephew, has been helping us out over the last few weeks and he managed to get some time on the rods when Dave went off for a shower. A couple of years ago on his last visit, he had a 34lb PB Mirror and he’s been at it again. Another new PB Mirror of 36.6lb, and what a beauty…. 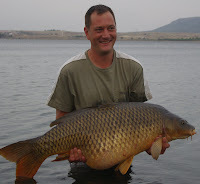 Novice Carp angler Dave decided to dive in at the deep end and take on the Orellana. George joined us for a couple of nights, keeping us well entertained with his antics. On his previous overnight visit he took his PB to 28lb, this time he joined us for 3 days and had three 30lb plus fish out. The fishing went a little quiet for a couple of days due to a brisk easterly wind, however George kept us from getting bored. Mauld wine was brewed, steaks cooked Flambé style, you can imagine what happened when far too much Vodka was poured on… When Dave returned from the shower run he found he had a lovely garden around his bivvy – and Dave wants George to join him next year, can’t wait….